This iconic structure housed royalty during the Sanzan Period in the mid-1300s and later served as the administrative center for the entire region. But between 1609 and World War II this epicenter of culture, history and politics was burned or destroyed multiple times. As a result, the surrounding community came together to rebuild the castle from photographs, drawings and even shared memory. Travelers who wander the restored grounds can explore the Stone Gate of Sonohyan-utaki, built during the reign of King Sho Shin. Its ornate details exemplify the mastery of stone working skills exhibited by early masons. The Shikina-en Gardens offer visitors a chance to reflect on the century’s long history of Shuri Castle while walking across the delicate Chinese-style bridge. The tiny islands dotting the quiet pond and impeccable landscape are just part of what makes Shuri Castle a UNESCO World Heritage site that’s worth a visit. Shuri Castle is located just north of Sakiyama Park in Naha. Explore Naha, Okinawa at your own pace and explore sites of your own interest as you get a feel for local life on this private guided walking tour. 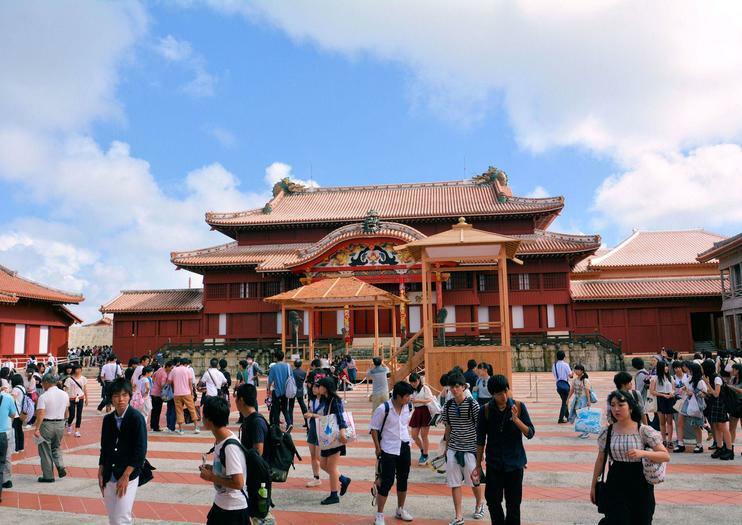 Your itinerary is flexible and customizable, but possible sites include the UNESCO World Heritage-listed Shuri Castle, Makishi Public Market, known for its variety of fresh seafood, and Tamaudun Royal Mausoleum where the second Sho dynasty is entombed. Your guide shares insights into each site as you walk. Fly over historic Shuri Castle from the air flying toward East Coast of Okinawa Main Island in Sky Trek's comfortable Kodiak100 aircraft.